Landlocked country flourished since 6th century is famous for its scenic beauty and Buddhist sites. Kathmandu capital of Nepal is the home of tourism from all around the world, enriched and blessed with temples that are listed among one of the world's heritage sites. Popular cities include Patan, Bhaktapur, Pohkhara, Lumbini and Chitwan. All of them are famous for monasteries and for bewitching beauty that is spell bound. Country with having highest peak in the world, Mt.Everest. 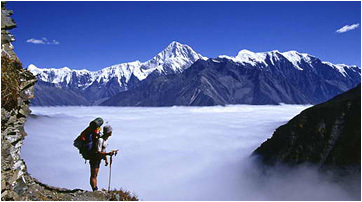 It is place for many adventures such as trekking, paragliding and bungy jumping. Political System: Multi-party democracy with constitution monarchy. Nepal is land lock country. Land Area: 147181 Sq. Kms. Lengths 885 Kms. East-West Widths. 193. North-South. Population 2, 40, 00,000 Approx. Culture: Hinduism is lifeblood of the Nepalese.